Considering the festive season, the e-commerce site Flipkart is once again bringing the cell to the customer. Flipkart Festive Dhamaka Days will start from October 24. Flipkart Festive Explosion Day Sale will last till October 27 Flipkart cell, which lasted for four days, offers great deals and offers on all major products. During the Flipkart Big Billion Days Sale held last week, the company had sold record sales of smartphones. Amazon India has also announced the Great Indian Festival cell. The sale of the Amazon Great Indian Festival will begin next week. Cells for Flipkart Plus Members will start from 9 o'clock on October 23. Free Delivery, Priority Customer Care, Reward Points, and other facilities, while keeping Flipkart Plus members on priority. 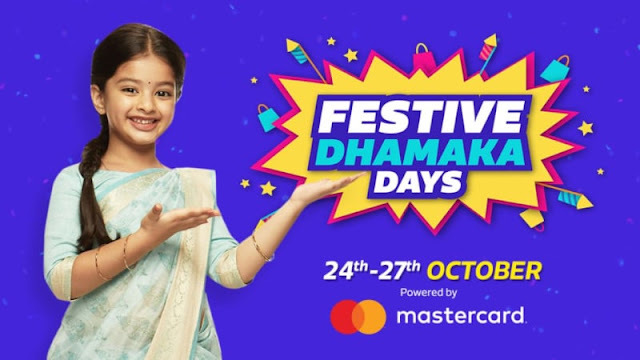 Flipkart has partnered with Axis Bank for Festive Dhamaka Days. It will be directly benefited by the customers, the company has not yet taken the curtain from the fact that the customers will be given cashback during the sale or the instant discount. Payment offers will be available on both Axis Bank debit and credit card. During the Festive Explosive Day Sale, there will be an EMI on Flipkart Selective Debit Card, all major credits and Bajaj Finserve cards with no interest EMI. Apart from this, customers can avail the cashback offer by paying with PhonePe. Flipkart said that apart from the discount on the smartphone, there will be protection plans, exchange offers, and guaranteed buyback options. If you missed out on upgrading your old smartphone during the Big Billion Days Sale, then you have another chance. In addition to the handset, Flipkart Festive Dhamaka Days will get a discount of up to 70% on TV and Appliances. Exchange offers and non-interest EMI facility will also be offered on these products.